What is the Fortnite game? Fortnite: Save the World, a cooperative shooter-survival game for up to four players to fight off zombie-like creatures and defend objects with fortifications they can build. Fortnite Creative, where players are given complete freedom to create worlds and battle arenas. Fortnite Save the World and Fortnite Battle Royale game modes were released in 2017 as early access titles and Fortnite Creative was released on December 6, 2018. Save the World is available only for Windows, macOS, PlayStation 4, and Xbox One, while Battle Royale has been released for those platforms in addition for Nintendo Switch, iOS and Android devices. What items are included in Fortnite Items? The Fortnite game deleveloped by Epic Games, which has so many Fortnite Items in-game, includes Fortnite Materials, Fortnite Weapons, Fortnite Traps, and Fortnite Package. So Fortnite players can use all of Fortnite Items to leve up through gained experience to improve their attributes. Where can players buy Fortnite Items safe? Buy Fortnite Items (Fortnite Materials, Fortnite Weapons, Fortnite Traps, and Fortnite Package), and other Fortnite items at Joymmo.com instead of spending hours looking for! We are the trustworthy Fortnite Items online store to offer best Fortnite goods with cheapest price for you. Just enjoy on the Fortnite platform as PC (Microsoft Windows), PlayStation 4 (PS4), Xbox One, Nintendo Switch. 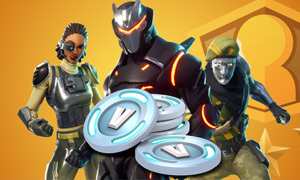 What are the functions of Fortnite V-Bucks (Game Virtual Currency) in game? While the Fortnite game itself is free to play, players can use Fortnite V-Bucks to purchase Fortnite items and unlock features in Fortnite. For frineds gift, you can put away the gift cards and Top Up Fortnite V-Bucks for the ever-popular video game Fortnite. 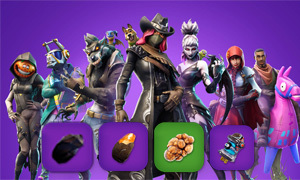 The Fortnite digital game currency is a hot commodity, more than 100,000 players buy Fortnite V-Bucks from Joymmo.ocm online store per month. Just order cheap Fortnite V-Bucks for young teen and your friends now!